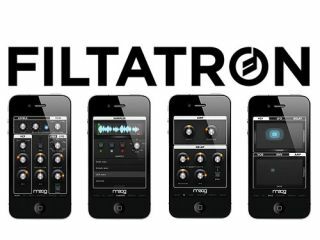 PRESS RELEASE: Moog Music today announced Filtatron, a real-time audio effects engine and powerful studio tool coming soon for the iPhone and iPod Touch. The heart of the Filtatron is a finely-modeled Moog Ladder Filter, the same filter that gives Moog instruments their warm, thick character. It musically shapes the sounds supplied by the Filtatron's on-board oscillator, sampler and line/microphone input. "Filtatron represents the first time that the signature Moog sound is available outside of a high-end, hand-made Moog synthesizer," said Mike Adams, president of Moog Music. "This powerful app extends the studio capabilities of traditional Moog users, and also provides music enthusiasts and Moog fans a fantastic way to create and share their personalized presets. All for a price that makes the Moog sound accessible to a wide audience." Filtatron will be available October 18, 2010 for the iPhone and iPod Touch for $4.99. Moog Ladder Filter: 4 pole resonant Moog Ladder Filter, with Lowpass and Highpass modes and adjustable cutoff and resonance parameters. Oscillator: a high-resolution, alias-free DSP oscillator with sawtooth and square waveforms, adjustable frequency from 0.3 Hz to 2kHz. LFO: five waveforms: sine, ramp, sawtooth, square, sample & hold, with crossfade and morph between adjacent LFO shapes. Envelope Follower: uses the volume envelope of sound inputs to sweep the filter, with controls for amount and speed. Amp and Delay FX Modules: Amp provides warm, smooth overdrive with feedback control. Delay can be modulated by its own LFO (with rate and depth controls) and delay time is smoothly interpolated for analog-style delay time tweaks. File Sharing: Easily move audio files back and forth between the Filtatron and your computer. Audio Copy and Audio Paste enables sharing audio between the Filtatron and other compatible apps. Built-in email function allows sharing presets with other Filtatron users. Record and Playback: All audio processed in stereo, 16bit, 44.1kHz resolution. Filtatron will record samples up to 10MB. Tap and Drag sets start and end points for seamless looping. Playback control can be adjusted from double-speed playback all the way down through zero to double-speed reverse.